‘The Entangled Sea: The Mediterranean in history and prehistory’ (with Prof Louise Hitchcock). International Conference, University of Manchester, June 2018. Conference sessions on ‘Exploring maritime and riverine mobility’ (with Prof Louise Hitchcock). Australian Archaeological Association Congress, Ta Trobe University, Melbourne, December 2017. The poetics and physics of clay: diverse approaches to materiality', CIDRA workshop, University of Manchester, March 2012. The Present and Future of Prehistoric British Pottery'. Joint Conference of the Prehistoric Ceramics Research Group and Prehistoric Society, The Manchester Museum, October 2010. Workshop on 'Wheel-fashioning trajectories in the eastern Mediterranean and the Near East' (with Dr Valenine Roux). 6th International Congress on the Archaeology of the Ancient Near East (ICAANE), Rome. May 2008. 'Breaking the Mould: Challenging the past through pottery'. Joint conference of the Prehistoric Ceramics Research Group and The Prehistoric Society, University of Manchester, October 2006. The Cyclades and the Aegean Islands in Prehistory. The book explores the history of interaction between Crete and the Cycladic islands from the late Middle to Late Bronze II periods when Minoan influence was at its peak. Based on a thorough investigation of pottery assemblages from Phylakopi, Ayia Irini, Paroikia and Mikre Vigla, the book advocates a rethink of established acculturation scenarios (such as "Minoanisation"). Openness or closure towards outside influences was not predetermined by cultural, geographical or ecological variables but was socially constructed and, in some cases, might even be considered a conscious social strategy. 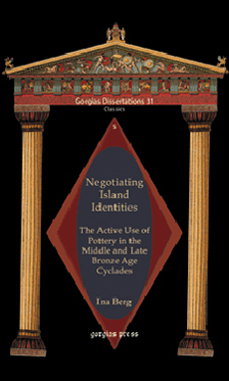 As such, the book contrasts static and deterministic models of insularity and contact with complex, flexible and culturally determined perspectives which acknowledge the ability of island communities to consciously fashion their worlds and make choices about the nature and degree of interaction with their neighbours. Berg, I. 2018. Making and skill. In: S.L. Lopez Varela (ed.) The SAS Encyclopedia of Archaeological Sciences. Wiley. New York. Berg, I. 2018. X-radiography and ceramics. S.L. Lopez Varela (ed.) The SAS Encyclopedia of Archaeological Sciences. Wiley. New York. Berg, 2018. Conflict and crisis in prehistoric societies: the potential of pottery, in: Caloi, I. and C. Langohr (eds.) Technology in Crisis. Technological changes in ceramic production during periods of trouble (Aegis 16). Brussels: Presses Universitaire de Louvain, pp. 93-110. Berg, I and J. Ambers 2017. X-Radiography of archaeological ceramics, in: A. Hunt (ed.) Handbook of Archaeological Ceramic Analysis. Oxford: Oxford University Press, pp. 544-564. Berg, I. 2015. Potting skill and learning networks in Bronze Age Crete, in: Gauß, W., Klebinder-Gauß, G, and C. von Rüden (eds.) The Transmission of Technical Knowledge in the Production of Ancient Mediterranean Pottery. Wien: Österreichisches Archäologisches Institut, pp. 17-34. Berg, I. 2013. Marine creatures and the sea in Bronze Age Greece: ambiguities of meaning. Journal of Maritime Archaeology 81-27. Berg, I. 2013. The potter's wheel in Mycenaean Greece: A re-assessment. In: Graziadio, G., Guglielmino, R., Lenuzza, V. and S. Vitale (eds.) Φιλικη ∑υναυλια. Studies in Mediterranean Archaeology for Mario Benzi (BAR International Series 2460). Oxford: Archaeopress, pp. 113-122. Berg, I. 2011. What's in a forming technique? An Investigation into Wheel-throwing and Wheel-coiling in Bronze Age Crete. Old Potter's Almanack 16, 9-12. Berg, I. 2011. Towards a conceptualisation of the sea: artefacts, iconography and meaning, in: G. Vavouranakis (ed.) The Seascape in Aegean Prehistory. Athens: Danish Institute at Athens, pp. 119-138. Berg, I. 2011. Exploring the Chaîne Opératoire of Ceramics through X-radiography, in: S. Scarcella (ed.) Archaeological Ceramics: A Review of Current Research, BAR International Series S2193. Oxford. Archaeopress, pp. 57-63. Berg, I. 2010. Re-capturing the sea: the past and future of 'island archaeology' in Greece Shima - The International Journal of Research into Island Cultures. 4.1, 16-26. Berg, I. (forthcoming). Clay Pottery and Figurines: Establishing Manufacture through X-radiography. In: E. Kyriakidis (ed.) The Philioremos Peak Sanctuary. Cotsen Institute of Archaeology, UCLA: Los Angeles, California. Berg, I. 2009. X-radiography of Knossian Bronze Age Vessels: Assessing our Knowledge of Primary Forming Techniques, Annual of the British School at Athens 104, 137-173. Berg, I. 2008. Looking through Pots: Recent Advances in Ceramics X-radiography. Journal of Archaeological Science 35, 1177-1188. Berg, I. 2007. Meaning in the Making: The Potter's Wheel at Phylakopi, Melos (Greece), Journal of Anthropological Archaeology 26, 234-252. Berg, I. (2007) 'Aegean Bronze Age seascapes: a case study in movement, contact and interaction', in: S. Antoniadou and A. Pace (eds.). Mediterranean Crossroads. Athens. Pierides Foundation, pp. 387-415. Berg, I. (2006) 'The 'Western String': A Reassessment', Proceedings of the 10th International Cretological Congress, Society of Cretan Historical Studies, 135-150. Berg, I. 2006. A Comparative Look at the Use of the Potter's Wheel in Bronze Age Greece, in: Ancient Greek Technology. Proceedings of the 2nd International Conference on Ancient Greek Technology. Athens: Techniko Epimelitirio Helladas, pp. 189-194. Berg, I. (2004) 'The Meanings of Standardization: Conical Cups in the Late Bronze Age Aegean ', Antiquity 78, 74-85. Berg, I. 2004 Performing Religion: Practitioners and Cult Places in Minoan Crete, in: T. Insoll (ed. ), Belief in the Past. The Proceedings of the 2002 Manchester Conference on Archaeology and Religion (BAR International Series 1212), pp. 20-35. Berg, I. (2002) 'Negotiating Island Identities: Ceramic Production in the Cyclades during the Middle and Late Bronze Age', World Islands in Prehistory. International Insular Investigations. V Deia International Conference of Prehistory, BAR International Series 1095, 186 - 188. Berg, I. (2000) 'The Pots at Phylakopi: Applying Statistical Techniques to Archaeology', Chance, 13, 8 - 15. Berg, I. (1999) 'The Southern Aegean System', Journal of World Systems Research 5, 475 - 484. Berg, I. 2017. Book review of Hruby and Trusty, From Cooking Vessels to Cultural Practices in the Late Bronze Age Aegean, Journal of the Prehistoric Society, 3 pages. Online publication. Berg, I. 2016. Book review of Bevan and Conolly, Mediterranaean Islands, Fragile Communities and Persistent Landscapes. Antikythera in the Long-Term Perspective, Journal of Hellenic Studies 136, 264-266. Berg, I. 2014. Book review of Tartaron, Maritime Networks in the Mycenaean World, Cambridge Archaeological Journal 24, 544-546. Berg, I. 2014. Book review of Orton & Hughes (2nd ed. ), Pottery in Archaeology, Journal of Post-Medieval Archaeology 48, 526-527. Berg, I. 2013. Book review of Tolias, Mapping Greece, 1420-1800, Cartographica 48,, 151-152. Berg, I. 2012. Book review of O'Connor, Clark and Leach, Islands of Inquiry: Colonization, Seafaring and the Archaeology of Maritime Landscapes, Island Studies Journal 7, 163-165. Berg, I. 2012. Book review of Billig, Inseln. Geschichte einer Faszination, Island Studies Journal 7, 150-153. Berg, I. 2010. Book review of Hurcombe, Archaeological Artefacts as Material Culture, Cambridge Archaeological Journal, 20, 278-279. Berg, I. 2009. Book review of Renfrew et al. (eds.) The Excavations at Phylakopi 1974-1977. Gnomon 81. 624-627. Berg, I. 2007. Book reviews of J. Chrysostomides, C. Dendrinos and J. Harris (eds. ), The Greek Islands and the Sea, and F. Lätsch, Insularität und Gesellschaft in der Antike, Journal of Hellenic Studies 127, 208-209. Berg, I. 2003. Book review of 'T. Hölscher, Klassische Archäologie: Grundwissen, Antiquity 77, 637-638. Berg, I., 2001. Book review of 'C. Broodbank, An Island Archaeology of the Early Cyclades' and 'C. Souyoudzolgou-Haywood, The Ionian Islands', Antiquity 75. 2, 438-440. Berg, I., 1999. Book review of 'Thera in the Bronze Age' (1997) by Phyllis Young Forsyth, in: Archaeological Review from Cambridge 16.1, 136-139.